Ahead of the International Open Data Conference in Buenos Aires, we’re publishing quick-read ‘key points’ summaries based on the authors work, as well as public drafts of a number of chapters. For our cross-cutting issue chapters we’ve prepared public drafts of each, along with quick-read key points which you can read below. You can also read our summary blog post of State of Open Data findings so far here. Understanding data infrastructure by analogy to physical infrastructure like roads and rail helps us to see the range of components that make up data infrastructure: from datasets and servers, to standards, policies, rules and governance mechanisms. Just as the quality of physical infrastructure, and the capacity of governments or private sector to maintain it, varies across the world, so too access to high quality data infrastructure is unequally distributed. This will leave some countries much less able to secure the benefits of open data. Open standards, identifiers and registers (reference data) are essential building blocks of data infrastructure, yet often lack investment and see limited adoption. Data infrastructures in future will need to accommodate both open data, and more restricted access datasets. It will be important to build both trust and a default of openness in our data infrastructures to maximise their social and economic value. Privacy concerns are increasingly at the forefront of debates about data. There has been a growing focus on privacy issues in advocacy and work on open data. Privacy rights are complex, and are not absolute. There is often a balance to strike between transparency and privacy when government information about individuals is involved. Striking this balance requires training and resources, and combined commitments to both respecting privacy and advancing openness. Open data availability has increased faster than open data use. A key factor in this has been low levels of data literacy amongst individuals and organisations who could benefit from open data. There is a dearth of evidence providing data literacy baselines, a lack of systemic interventions to build data literacy, and limited research on what works. Existing initiatives face funding or organisational challenges in working out how to scale. When organisations have access to a range of data skills, they can be more effective in making use of open data. Understanding ‘data as a team sport’ can help move from framings of individual data literacy, to an understanding of organisational data maturity. Work on gender equity is an important new frontier for open data communities: drawing on, and connecting to, many decades of wider work and feminist advocacy and action. Gender impacts on issues of infrastructure and access, representation within datasets, and labour and leadership within open data communities. A commitment to gender equity must address both gender bias in data collection and publication, and patterns of exclusion within open data communities. Action requires both work to challenge embedded patriarchal attitudes and norms, and practical steps to create better data, adopt clear policies, and promote opportunities and safe spaces for women. Measurement is critical to the future of open data because it provides a mechanism to track changes over time. Measurement has also played a role in securing improved engagement from some governments in open data work. There have been a range of initiatives to quantity open data readiness, implementation and impact, with methods including expert surveys, crowdsourced data collection, and detailed dataset assessments. Whilst each initiative brings its own contribution, there is some duplication of effort, and opportunities for better coordination. There is significant untapped potential in the data gathered for measurement: which is mainly used for one-off reports, rather than ongoing research. The future of open data measurement work needs to improve alignment between measurement, government and researcher needs, and media interpretation of the measurements. Future measurements need to build on authoritative common criteria and/or principles (e.g. Open Data Charter principles). 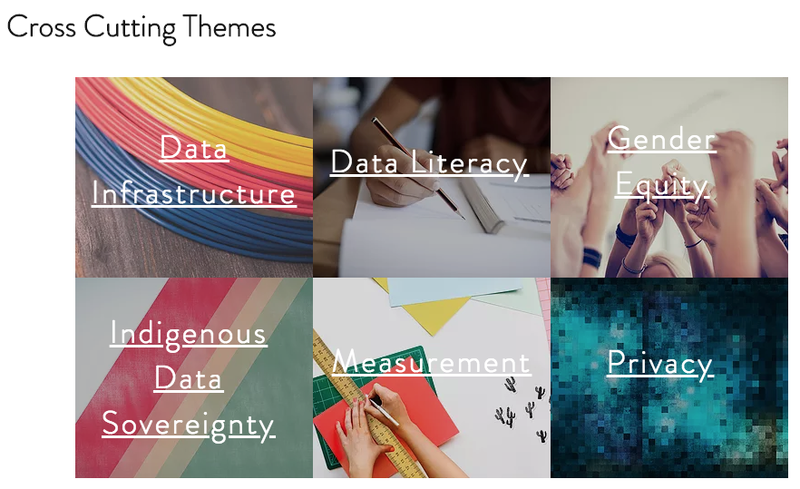 Indigenous Data Sovereignty (IDS) has emerged as an important topic over the last three years: raising fundamental questions about assumptions of ownership, representation and control in open data communities. IDS describes the right of Indigenous peoples to control data from and about their communities and lands — articulating both individual and collective rights to data access and to privacy. Ideas from IDS provide a challenge to dominant discourses in open data, questioning current approaches to data ownership, licensing and use in ways that resonate beyond Indigenous contexts, and that draw attention to the power and post-colonial dynamics within many data agendas. Growing IDS networks are working to shape open data principles to better respect the rights of Indigenous peoples.